• Clean the strap and dial by a soft cloth on regular bases is highly recommended. Water resistance to 164 ft (50m) 5ATM: You Can shower, Handwash .indoor and outdoor activities or daily daily use. NOTE: please DO NOT press any buttons in the water. COMFORT with FASHION: silicone rubber watch band with the fashion design make it comfortable to wear and lead you to the edge of sport fashion. Perfect for both indoor and outdoor activities, great gift for Children. MULTI-FUNCTIONAL (WEEK DAY IS AUTOMATICALLY CALCULATED ACCORDING TO YEAR-MONTH-DATE SETTING) : Calendar Month / Day / Date, Week, Alarm, 12/24H Water Resistant, LED Display, Back Light, Shock Resistant, Stop Watch. What you waiting for? 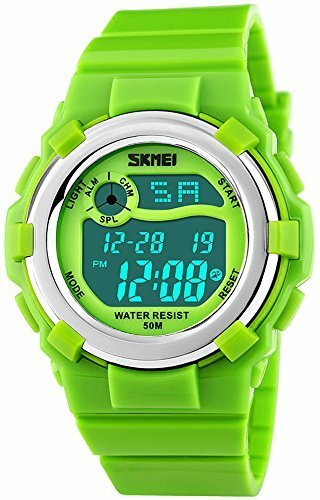 This a great value watch for Children, you don't want to miss. If you have any questions about this product by Fanmis, contact us by completing and submitting the form below. If you are looking for a specif part number, please include it with your message.